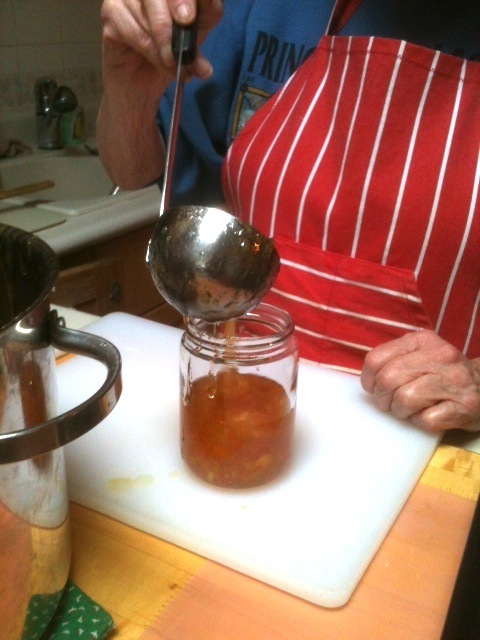 Seville oranges, difficult to source here on the island but readily available in stores in January, means time to make marmalade. Usually my jar just magically appears from my mother’s kitchen, all nice and orange and full of bits. This year I wanted to get in on the action, see what it involved. The oranges, plus a lime and lemon, were peeled when I arrived, so our first task was to remove some of the pith from the skins, and then slice them into tiny pieces. 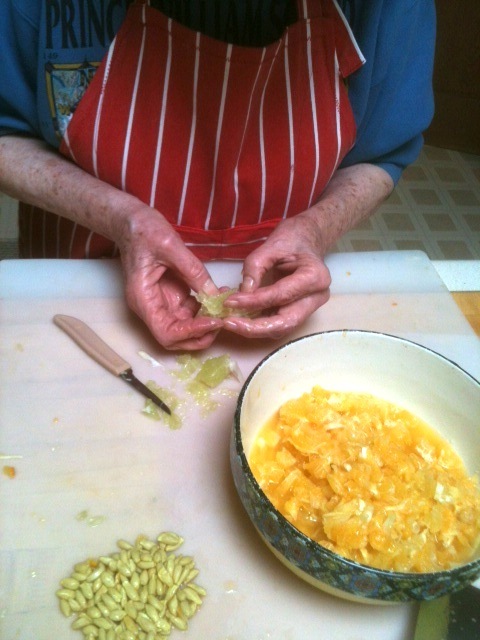 A heady citrus fragrance filled the kitchen as we chopped and sliced. 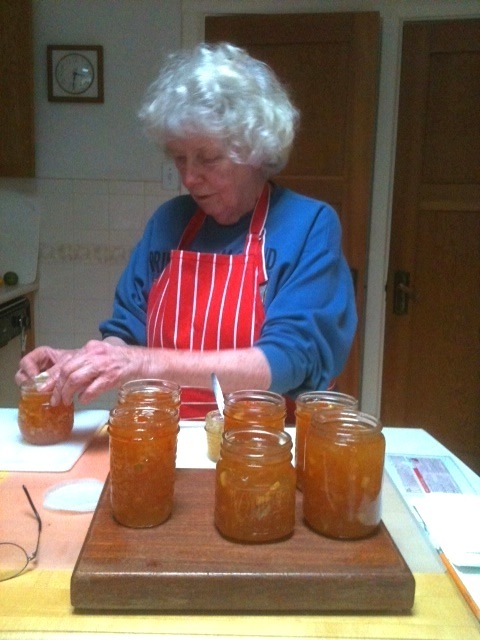 Releasing the pits and slicing the orange segments was mushy, wet and fiddly; the most tedious part of the whole process according to Mum. 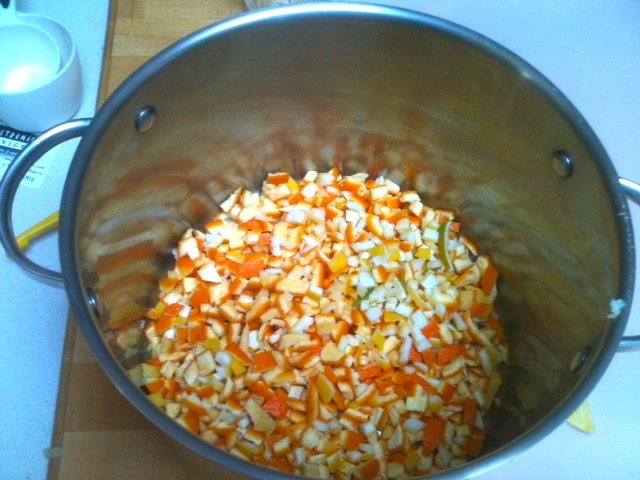 Meanwhile, the peel pieces were simmering. “Here, try one of these, see if it’s soft enough,” says Mum. So what do I do? I eat it, and promptly bitterness explodes my mouth and I’m left with a ringing numbness for about an hour. No wonder they use orange peel for cleaning products. “You weren’t supposed to eat it, just bite to see if it’s done,” says Mum, amused. Well, the peel is done, I reckon, so we add the pulp and I gratefully heap in the sugar and more sugar while the orange slop bubbles away and my hand gets hot from the rising steam. We use Certo to cut down on the time spent slaving over a hot stove. And then suddenly it’s ready. 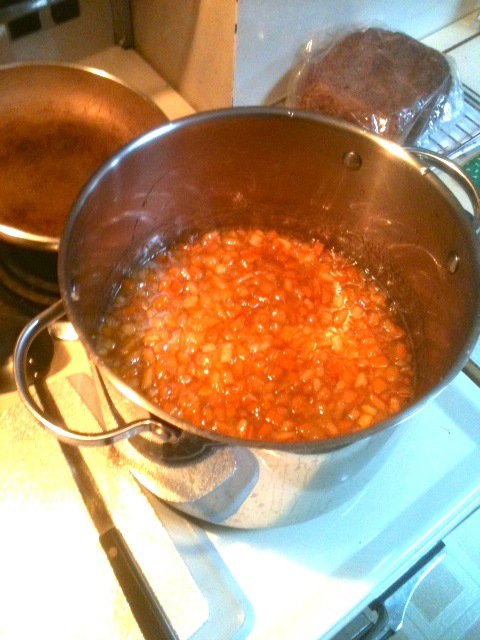 The jars are sterilized by roasting and the lids by boiling, so they’re now ready to receive. Wax paper is cut into circles and carefully placed on top, making sure there’s no air bubbles. Voila! Louise and Mum, Rita. Good question. I’m really no expert, but I think the top of the marmalade has to be sealed somehow because there is still unsterilized air between the top surface and the lid. My mother used to seal the jars with two thin layers of hot paraffin wax on top of marmalade or jam, and I thought the wax paper was a lot less trouble, and it seems to work. I omitted it once and there was a bit of mildew on the top when we opened them. Who knows how those little bugs crawl in! A good way to speed up the whole process is to measure out all the sugar at the very beginning and warm it in the oven (225º) with the jars while you do all the chopping, etc. This reduces the time it take to bring it all to a boil while adding the sugar. 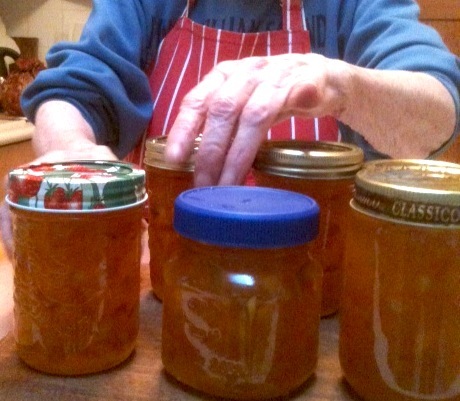 I used to make several cases of marmalade every year to give as gifts. I used small canning jars and processed them in boiling water for 10 minutes. Never had any spoilage, which I had sometimes when I just used paraffin wax. Now I use this method whenever I make jam.